The RSD-10 Digital Sharing Device enables up to 8 modems or terminals to share a master modem, a multiplexer or a computer port in a multipoint environment. The RAD RSD-10 operates at seven selectable data rates up to 19.2 kbps, synchronously or asynchronously. 3) External from DCE connected to sub-channel 1. The built-in buffer of the RSD-10 overcomes clock differences between the modem clocks connected to the sub-channels and the RSD-10 main channel transmit clock. 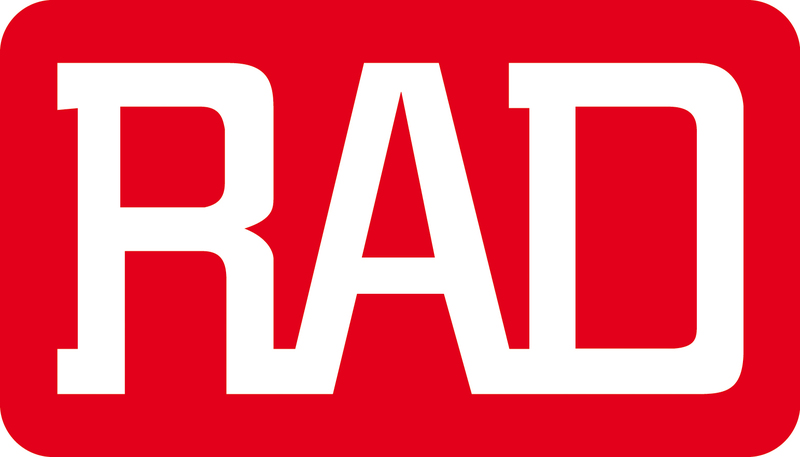 Information is broadcasted by the main channel of the RSD-10 to all sub-channels in parallel. Sub-channels contend to transmit to the main channel by activating RTS/DCD, or by data transition (strap-selectable). If the RTS/DCD or data of a sub-channel is active, the sub-channel’s transmit data and control signals are connected to the main channel. When RTS/DCD drops or data transmission ceases, the control circuitry switches to monitor other sub-channels. A sub-channel is disconnected immediately after it drops RTS/DCD or transmits 16 idle bits. for longer than a preset time. The automatic disable resets whenever the sub-channel RTS/DCD drops, or 16 idle bits are transmitted (data contention). Front panel indication is provided for each sub-channel disabled by automatic circuitry. The sub-channel can be manually disabled from the front panel as an alternative. adjustments enable easy installation and operation. All necessary crossover connections are performed internally, and only straight-through cables are used to connect the modems or terminals to the RSD-10. The RSD-10 is provided with special hardware for mounting in a 19" rack, occupying 1U in height. 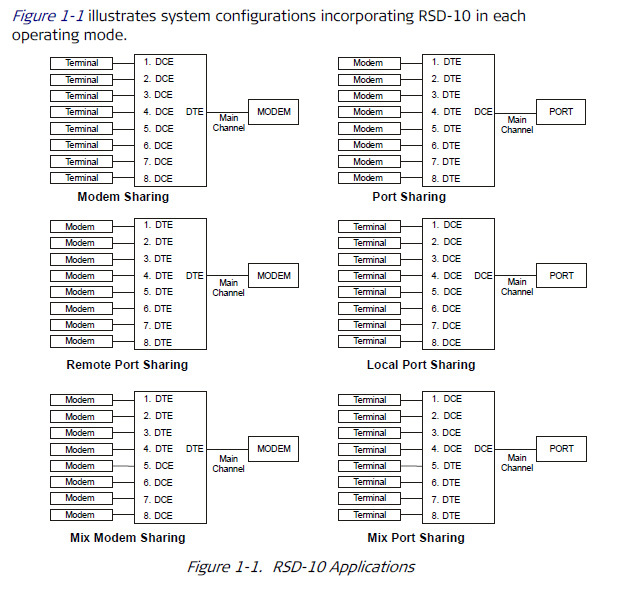 RSD-10 operates in one of six modes: modem sharing, port sharing, remote port sharing, local port sharing, mix modem sharing and mix port sharing.